Today, the Church rejoices in thanksgiving for Mary’s singular cooperation with the action of the Holy Spirit. 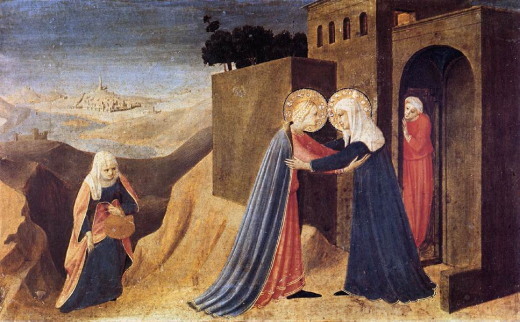 In the story of the Visitation, Mary teaches us not only how to give praise to God, but also how to respond to God’s love in action. Mary’s cooperation first teaches us the way of obedience to God’s will. “May it be done to me according to your word” (Luke 1:37) is the prayer of every man and woman seeking to live the Christian way of life. 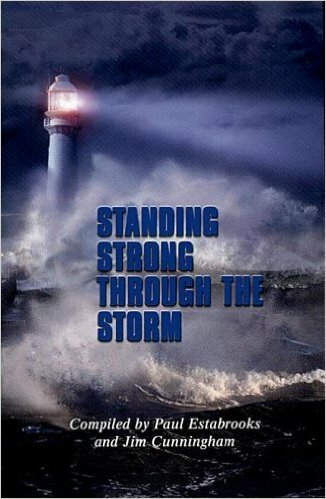 Then, her spoken commitment is confirmed in action as she moves – with haste – to visit her cousin, who herself has experienced the miracle of a pregnancy that is important to God’s plan for salvation. In the joy of the cousins’ greeting we are given part of one of the most beloved prayers in the Catholic tradition – the Hail Mary, “blessed are you among women and blessed is the fruit of your womb” (Lk 1:42). In hearing Elizabeth’s response, we also become witnesses to the first time in Scripture that Mary’s faith is praised. This two-fold response of faith and action is a lesson for us that faith is inseparable from charity. 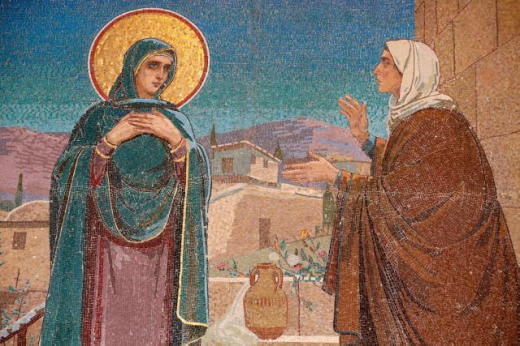 Hearing God’s Word invites us to respond not just in praise but also in loving acts such as Mary’s assistance to her cousin as Elizabeth neared the end of her pregnancy. Mary teaches us to go out of ourselves on a journey of sacrifice, love and service, so that as pilgrims on the road, we may sing the wonders that God has done in us as he promised. In this, Mary becomes an example of Christian virtue. As Saint Ambrose taught, the Mother of God is a model of the Church in the order of faith, charity and perfect union with Christ (Lumen Gentium 63, see also Deus Caritas Est, 41-42). Among the members of the Church, she stands out as eminent in holiness. Catholics of every rank and condition can find in Mary a model of faith, obedience, purity, poverty of spirit and generous love. The ants had formed a long marching line that went from one side of our backyard, all the way across to the other side. It actually was quite impressive. I stopped to watch them scurry across the concrete patio. I leaned over to get a better view of their industrious work. Some were carrying loads that were three times their size. Some were going back the other way, as if to be returning for more things. Some would stop for only a split second to greet the other. Maybe they were giving directions. They seemed to be on a mission; going somewhere specifically, I’m assuming, to setup a new location for housekeeping. They were tireless in their endeavors. In the book of Proverbs, we are told to be wise like an ant, and work. When we become children of God we have a job to perform. Many times Jesus referred to the field being ripe for harvest. Our job is to work diligently, like an ant, and gather the harvest into the barns. We know that a crop left in the field, will go to waste in the winter snows. The harvest are people. Our mission is to gather these people’s hearts to know Jesus Christ. There is a story to tell that only we, who are in Christ, can tell. Proverbs 30:25 says, “Ants are small and weak, but they save their food all summer.” (ERV) That means that it doesn’t matter their size or strength, they have a job, and together that do it. When they work together, they get the job done. We may feel weak and insignificant, but when we accept God’s gift of salvation, we are not weak at all. 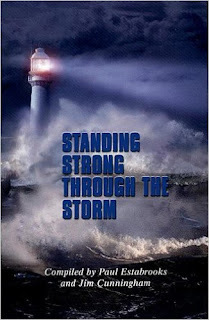 We are strong, by His strength. He will help us to go, to speak, to listen, to show love, to forgive as we have been forgiven, to set an example, and to give all we have to others. We don’t have to be highly intelligent or schooled to tell others about what Jesus has done personally for us. We have a job to do. When we go, in the name of Jesus, and labor in love, God will produce. When we march one by one, all together as a colony, we can accomplish much. We must work before the winter comes. Consider yourself an ant, and be wise…work! Girlfriends in God - What’s Love Got to do With It? Years ago I experienced a memorable God-moment when my flight had been delayed. On that particular warm June morning, I had gotten to the Philadelphia airport crazy-early and was eager to get home to my young family after a beautiful weekend of ministry. No lie - when I saw that my flight was delayed, I was bummed. My initial disappointment, however, dissolved into gratefulness, as the extra airport time became an opportunity for me to have extended personal worship. As I sat facing the flat runway, a fiery orange ball began to rise over the horizon that was simply breathtaking. I couldn’t help but to reflect on God’s goodness as He bragged on Himself with the glorious sunrise. I remember sensing His presence and His pleasure deep inside as I considered a few of the reasons that I loved our amazing LORD. And in the chaos of the loud, bustling terminal, I felt a peace and serenity that was profound. Have you ever had one of those sweet, intensely personal moments with God that simply demanded a response? Have you really savored our Savior lately? Have you paused to adore Him today? What about yesterday? This week? In the midst of marriage, mothering and ministry, I constantly struggle with freeing up time to ‘just sit’ with God and worship… to behold Him in His sanctuary… yet this is what God desires most! Our affection. Our adoration. Our love. Before we pray together and tell God some of the endless reasons we love Him, I’d love to lead you to His heart with music. Click below to hear the song “Because” that’s featured on my blog. What do you praise Him for today? Think on that. Make a list. Give Him thanks. Worship! Then swing over to my blog and leave a comment telling me your top 3-5 things! Write a “love note” to someone special in your life as a blessing. Ask God to lead you in this. Ready for MORE love? To know God’s love deeper? If you’re like most women, you have things in your past that you’d like to forget or things in your present stressing you out. The result? Pain. Shame. Frustration. God is all about healing, restoration and peace. Gwen’s downloadable FREE 5 Day Broken Into Beautiful e-book will help to move your heart in this direction of hope. CLICK HERE to download yours now. 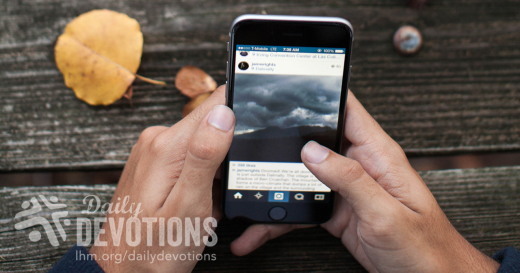 LHM Daily Devotion - May 31, 2017 "Changed by the Christ"
I have more friends on Facebook than does my wife Pam. Colossians 1:21-22 - And you, who once were alienated and hostile in mind, doing evil deeds, He has now reconciled in His body of flesh by His death, in order to present you holy and blameless and above reproach before Him. Now in some homes that might cause a problem. That trouble would begin if I went skipping around the house singing, "I've got more Facebook friends than you do." "First, I don't have a Facebook page." "Second, you wouldn't know half of your 'friends' if you met them on the street." Although it's shocking to some, Pam gets along just fine without a Facebook page or presence. She's a rarity. Far more common are the folks who judge the success of their lives on the number and quality of Facebook friends they have. 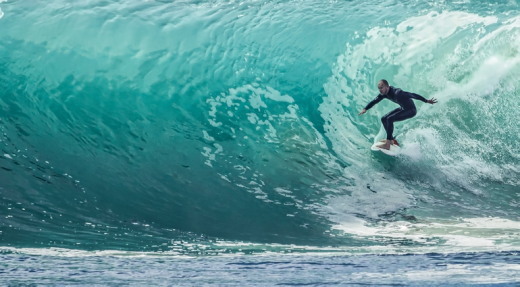 You know how it works: while a big total number of friends is important, having your share of successful people, wealthy people, well-known people, A-list people, all give you extra status. And a lack of such noteworthy individuals takes points off your status. So, what is a person to do if he doesn't know someone who is rich, famous, and good-looking? Simple, you go to Japan and contact a company called Real Appeal. When you arrive the company will place a catalogue n front of you. In that catalogue are all kinds of people who are attractive or give the appearance of wealth. You pick a photo and make an appointment with that individual. At the agreed-on time, the both of you will show up at the Real Appeal studios, and a photographer will spend two hours taking pictures of the two of you -- photos suitable for Facebook, photos that will make you look good, photos that will soon have other folks admiring you and inviting you to spend time with them. The $70 it costs to get these pictures is a small price to pay to make you look good to your family and neighbors. Unfortunately, there is no cheap shortcut that will make you look good to the Lord. There are a number of reasons for that. Not the least of those reasons is that while other people in your life may overlook some of your flaws and shortcomings, the Lord does not. Oh, don't get me wrong. The Triune God doesn't care if you are a snappy dresser, and He doesn't give a hoot if you can hobnob equally well with the Obamas and the Trumps. The only question the Lord asks is this: "Are you perfect?" If the answer is "No," then you can't make it onto the Lord's list of friends. And that, Daly Devotioner is bad news for us all. It's bad news because all of us have sinned and fall short of the glory of God (see Romans 3:23). So, are we destined to remain spiritual outcasts? -- sinful souls rejected for all eternity? Not at all. So your eternity might be changed, the Heavenly Father sent His Son into this world to be one of us. So we might be forgiven, saved, and made a member of God's family, Jesus came and did everything for us we couldn't do. And now, with Holy Spirit-given faith, we are forgiven and accepted by the Lord. Aparentemente, además de ser personas divertidas los australianos también son bastante creativos. En un artículo publicado en un periódico de Australia, se mencionan algunas de las excusas usadas para tratar de no recibir una multa. Algunas de las más creativas son:Iba muy rápido porque tenía zapatos nuevos y eran más pesados que los viejos. No era yo quien manejaba el auto, sino que me lo habían robado. Mi suegra me estaba apurando porque íbamos a llegar tarde. Había entrado una abeja al auto y pisé el acelerador sin darme cuenta. Iba más rápido en el túnel porque el humo me estaba haciendo toser mucho. Por mejores que suenen todas esas excusas, seguramente no serán nada comparadas con las que el Señor va a escuchar el Día del Juicio Final. Cuando Dios pregunte: '¿Por qué no creíste? ', muchas de las respuestas lo van a dejar estupefacto. Pero hay una excusa que espero que nuestro amoroso Dios no tenga que escuchar en ese día: "porque nadie me habló de Jesús". A través del sacrificio y resurrección de Jesucristo, el Señor ha hecho posible que todo hombre, mujer y niño, pueda recibir la fe, ser perdonado y salvado. Y para ello, cuando ascendió a los cielos, Jesús nos encomendó que compartamos su historia de salvación. Dije antes que había una excusa que esperaba que Dios no tuviera que escuchar en el Juicio Final, pero en realidad son dos. La segunda es que espero que Dios no tenga que escucharnos explicarle por qué no hicimos lo que nos pidió que hiciéramos. Hoy es el día, y este es el momento, en que sin poner excusas podemos compartir la historia de la salvación donde sea, con quien sea y como sea. A recente descoberta do “O evangelho de Judas” alega que Jesus pediu que Judas o traísse. Supostamente, Jesus queria que a morte o libertasse deste mundo material, para que pudesse novamente tornar-se um espírito puro. O problema nisso é que Judas não podia ter escrito esse manuscrito que traz o seu nome, já que ele foi escrito muito depois do tempo de Jesus. Mas como O evangelho de Judas foi descoberto, ele representa uma novidade para os que gostam de especulações. Propor uma história falsa para substituir o registro do Novo Testamento não é fato novo. O apóstolo Paulo escreveu: “Pois haverá tempo em que não suportarão a sã doutrina; pelo contrário, cercar-se-ão de mestres segundo as suas próprias cobiças, como que sentindo coceira nos ouvidos; e se recusarão a dar ouvidos à verdade, entregando-se às fábulas” (2 Timóteo 4:3,4). Há uma tendência, hoje, de olhar às novas teorias para minar a importância e veracidade da Bíblia. Mas Paulo nos diz: “…julgai todas as coisas, retende o que é bom” (1 Tessalonicenses 5:21). Baseados no conteúdo e na autoridade duvidosa de O evangelho de Judas, sabemos que se trata de uma fábula. O verdadeiro evangelho, as boas-novas, está com os apóstolos, que caminharam com Jesus e escreveram a mensagem transformadora de vidas, descrita no Novo Testamento. Confiar em Deus significa confiar em Sua santa Palavra. Kintsugi là một bộ môn nghệ thuật lâu đời của người Nhật Bản nhằm sửa lại những món đồ gốm bị vỡ. Bụi vàng được hòa với nhựa thông rồi được dùng để dán lại những mảnh vỡ hoặc để lấp đầy những vết nứt và kết quả là chúng dính chặt với nhau. Thay vì cố gắng để che giấu chỗ được sửa lại, thì bộ môn nghệ thuật này cố gắng làm điều gì đó để món đồ bị vỡ đó trở nên đẹp hơn. Kinh Thánh cho chúng ta biết rằng Đức Chúa Trời xem trọng giá trị của tấm lòng tan vỡ, khi chúng ta ăn năn thật sự về tội lỗi mà mình đã phạm. Sau khi Đa-vít phạm tội ngoại tình cùng Bát-sê-ba và tìm cách giết hại chồng của bà, tiên tri Na-than đã lên án ông và ông đã ăn năn. Lời cầu nguyện của Đa-vít sau sự việc này đã giúp chúng ta hiểu hơn điều Đức Chúa Trời mong đợi ở chúng ta khi phạm tội: “Vì Chúa không ưa thích sinh tế, dù con có hiến dâng. Tế lễ thiêu cũng không đẹp lòng. Sinh tế đẹp lòng Đức Chúa Trời, ấy là tâm linh đau thương; Đức Chúa Trời ôi! Lòng đau thương thống hối Chúa không khinh dể đâu” (Thi. 51:16–17). Khi tấm lòng chúng ta tan vỡ vì cớ tội lỗi đã phạm, Đức Chúa Trời sẽ sửa lại điều đó bằng tấm lòng tha thứ rời rộng được ban cho bởi Chúa Cứu Thế trên cây thập tự. Ngài đón nhận chúng ta bằng tình yêu thương khi chúng ta hạ mình xuống trước Ngài và khi đó mối liên hệ sẽ được phục hồi. Đức Chúa Trời thật là Đấng giàu lòng thương xót! Bởi sự ao ước nhìn thấy tấm lòng hạ mình và vẻ đẹp không gì sánh nổi của lòng nhân từ Ngài, mong ước rằng những lời cầu nguyện trong Kinh Thánh cũng là những lời cầu xin của chúng ta hôm nay: “Đức Chúa Trời ôi! Xin tra xét con và biết lòng con; xin thử nghiệm con và biết tư tưởng con; thử xem con có lối ác nào không, và dẫn con vào con đường đời đời” (Thi. 139:23–24). Lạy Cha yêu thương, hôm nay con muốn dâng lên Ngài niềm vui đến từ tấm lòng hạ mình ăn năn của con. Sự đau buồn theo ý Chúa sẽ dẫn đến sự vui mừng. Los sacrificios de Dios son el espíritu quebrantado… (v. 17). 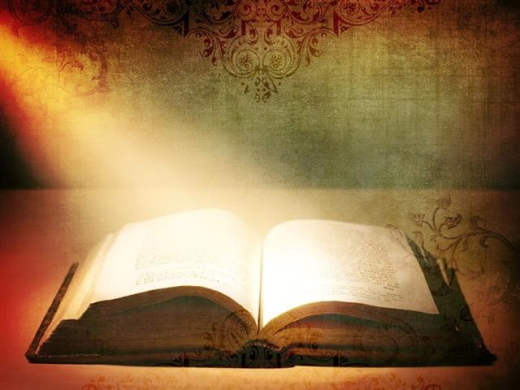 La Biblia enseña que Dios también valora nuestro quebrantamiento, cuando estamos arrepentidos del pecado que cometimos. Después de que David adulteró con Betsabé y tramó la muerte de su esposo, el profeta Natán lo confrontó y el rey se arrepintió. Su oración posterior nos permite vislumbrar lo que Dios desea cuando hemos pecado: «Porque no quieres sacrificio, que yo lo daría; no quieres holocausto. 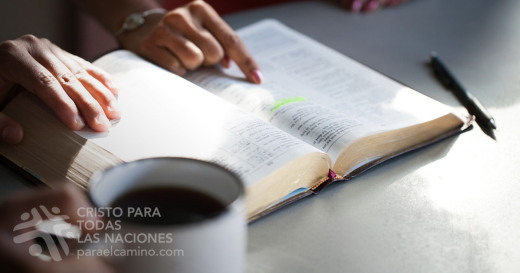 Los sacrificios de Dios son el espíritu quebrantado; al corazón contrito y humillado no despreciarás tú» (Salmo 51:16-17). ¡Cuán misericordioso es Dios! Que hoy podamos apropiarnos de otra oración de la Escritura: «Examíname, oh Dios, y conoce mi corazón; pruébame y conoce mis pensamientos; y ve si hay en mí camino de perversidad, y guíame en el camino eterno» (Salmo 139:23-24). Padre, quiero alegrarte con mi corazón humilde y contrito. La tristeza piadosa abre paso al gozo. 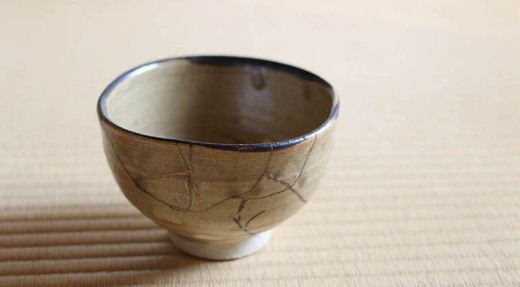 Kintsugi heißt die alte japanische Methode, Keramik zu reparieren. Ein besonderes Harz wird mit Goldstaub vermischt und mit dieser Masse werden die zerbrochenen Teile zusammengesetzt oder Risse gefüllt. So entsteht—trotz sichtbarer Reparatur—wieder etwas Schönes. Die Bibel sagt, dass Gott auch unsere Schäden reparieren will. Nachdem David mit Batseba Ehebruch begangen und den Tod ihres Mannes veranlasst hatte, konfrontierte der Prophet Nathan ihn mit seiner Sünde. David bereute. Sein anschließendes Gebet vermittelt uns eine Ahnung davon, was Gott sich wünscht, wenn wir gesündigt haben: „Mit Schlachtopfern bist du nicht zufrieden, sonst hätte ich sie dir gebracht und auch Brandopfer würdest du nicht annehmen. Das Opfer, das dir gefällt, ist ein zerbrochener Geist. Ein zerknirschtes, reumütiges Herz wirst du, Gott, nicht ablehnen.“ (Ps. 51,18-19) (NLB). Wenn uns das Herz bricht, weil wir gesündigt haben, repariert Gott es mit der Vergebung, die Jesus uns durch seinen Tod am Kreuz erwirkt hat. Wenn wir unsere Schuld aufrichtig bereuen, nimmt er uns in seiner Liebe wieder an. Wie gnädig ist Gott! Darum wollen wir heute noch ein anderes Gebet aus der Bibel mit in den Tag nehmen: „Erforsche mich, Gott, und erkenne mein Herz; prüfe mich und erkenne, wie ich’s meine. Und sieh, ob ich auf bösem Wege bin, und leite mich auf ewigem Wege“ (Ps. 139,23-24). Lieber Vater, ich möchte dir Freude machen und heute mit einem demütigen Herzen zu dir kommen. Wenn wir Gott betrübt haben, will er uns wieder froh machen. Le kintsugi est un art que les Japonais pratiquent depuis des siècles et qui consiste à réparer des porcelaines ou des céramiques brisées. Au moyen d’un mélange de poudre d’or et de résine, on recolle les morceaux ou l’on remplit les fissures, créant ainsi un liant des plus résistants. Au lieu de chercher à dissimuler la réparation, cet art crée quelque chose de beau à partir de quelque chose de brisé. Dieu accorde aussi du prix à notre brisement, si nous regrettons un péché avec sincérité. Après avoir commis l’adultère avec Bath‑Schéba et avoir fait tuer son mari, David s’en est repenti quand le prophète Nathan le lui a reproché. La prière que David a faite par la suite nous révèle ce que Dieu attend de nous quand nous péchons : « Si tu avais voulu des sacrifices, je t’en aurais offert ; mais tu ne prends point plaisir aux holocaustes. Les sacrifices qui sont agréables à Dieu, c’est un esprit brisé : Ô Dieu ! 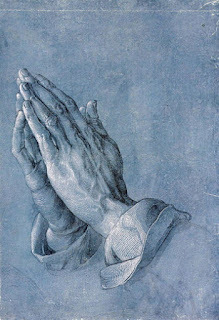 tu ne dédaignes pas un coeur brisé et contrit » (PS 51.16,17). Dieu restaure notre coeur brisé par le péché au moyen de l’inestimable pardon qu’il nous a généreusement offert à la croix. Si nous nous humilions devant lui, il rétablit avec amour notre communion avec lui. La tristesse selon Dieu conduit à la joie. Кінцугі – багатовікове японське мистецтво склеювання розбитих гончарних виробів. За допомогою золотого порошку й смолистої речовини склеюються черепки або замазуються тріщини. В результаті з’являється вражаючий шедевр! Це мистецтво робить дивну річ: замість приховування тріщин перетворює їх на справжню красу. Біблія стверджує, що Бог також цінує зламаний дух, коли ми щиро шкодуємо, що зробили гріх. Після того, як Давид вчинив перелюб з Вірсавією і потім спланував смерть її чоловіка, прийшов пророк і вказав царю на його гріх. Давид покаявся і навіть склав Псалом, який відкриває нам, чого чекає від нас Бог, коли ми згрішили: “Ти жертви не прагнеш, а дам цілопалення, − то не любе воно Тобі буде. Жертва Богові − зламаний дух; серцем зламаним та упокореним Ти не погордуєш, Боже!” (Пс. 50:18-19). Коли наше серце розбите через гріх, Бог відновлює його завдяки безцінному дару прощення, що пропонується Спасителем на хресті. Якщо смиряємося перед Ним, Він приймає нас з любов’ю, відновлює близькі з Ним стосунки. Який милостивий наш Бог! Зважаючи на вражаючу красу Божої ласки, давайте скажемо: “Випробуй, Боже, мене, і пізнай моє серце, досліди Ти мене, і пізнай мої задуми, і побач, чи не йду я дорогою злою, і на вічну дорогу мене попровадь!” (Пс. 138:23-24). Люблячий Отче, бажаю сьогодні принести Тобі радість своїм смиренним серцем, сповненим щирого каяття. Святий смуток дарує святу радість. Кинцуги – это многовековое японское искусство склеивания разбитой керамики. Золотая пыль смешивается с лаком, и с помощью этого «клея» соединяются осколки и заполняются сколы. Получается очень красиво. Вместо того чтобы скрывать следы ремонта, это искусство стремится видеть прекрасное в сломанном. В Библии говорится, что Бог также высоко ценит нашу сокрушенность, когда мы искренне раскаиваемся в сделанном грехе. После того как Давид согрешил с Вирсавией и подстроил смерть ее мужа, пророк Нафан обличил его, и царь покаялся. Молитва Давида показывает, чего ожидает Бог от грешника: «Жертвы Ты не желаешь – я дал бы ее; к всесожжению не благоволишь. Жертва Богу – дух сокрушенный; сердца сокрушенного и смиренного Ты не презришь, Боже» (Пс. 50:18-19). Когда наше сердце поражено грехом, Бог исцеляет его бесценным прощением, заслуженным Иисусом Христом на кресте. Он принимает нас с любовью, если мы смиряемся перед ним. Как милостив Бог! Помня о Его желании видеть в нас смиренное сердце и об удивительной красоте Его доброты, помолимся молитвой Давида: «Испытай меня, Боже, и узнай сердце мое; испытай меня и узнай помышления мои; и зри, не на опасном ли я пути, и направь меня на путь вечный» (Пс. 138:23-24). Любящий Отец, я хочу всегда радовать Тебя смиренным и сокрушенным сердцем. Богоугодная печаль ведет к настоящей радости. 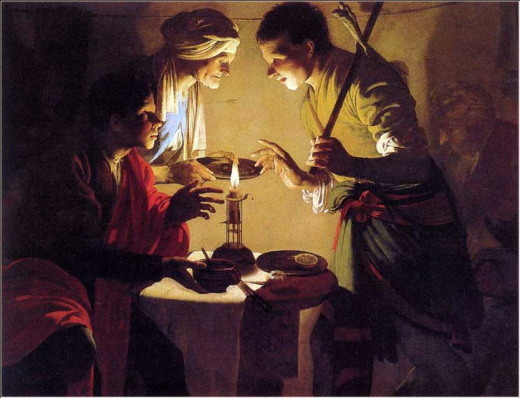 Esau Selling His Birthright, by Hendrick ter Brugghen, ca. 1627. Saviour Divine, cast thine eyes upon us! That brings forgetfulness of thy laws! May they go forth filled with thy gifts. See, the day! See, it comes! Your doom has gone out. The rod has blossomed, pride has budded. Violence has grown into a rod of wickedness. None of them shall remain, not their abundance, not their wealth; no pre-eminence among them. The time has come, the day draws near; let not the buyer rejoice, nor the seller mourn, for wrath is upon all their multitude. For the sellers shall not return to what has been sold as long as they remain alive. For the vision concerns all their multitude; it shall not be revoked. Because of their iniquity, they cannot maintain their lives. They have blown the horn and made everything ready; but no one goes to battle, for my wrath is upon all their multitude. The sword is outside, pestilence and famine are inside; those in the field die by the sword; those in the city-- famine and pestilence devour them. If any survivors escape, they shall be found on the mountains like doves of the valleys, all of them moaning over their iniquity. All hands shall grow feeble, all knees turn to water. They shall put on sackcloth, horror shall cover them. Shame shall be on all faces, baldness on all their heads. They shall fling their silver into the streets, their gold shall be treated as unclean. Their silver and gold cannot save them on the day of the wrath of the LORD. They shall not satisfy their hunger or fill their stomachs with it. For it was the stumbling block of their iniquity. From their beautiful ornament, in which they took pride, they made their abominable images, their detestable things; therefore I will make of it an unclean thing to them. I will hand it over to strangers as booty, to the wicked of the earth as plunder; they shall profane it. I will avert my face from them, so that they may profane my treasured place; the violent shall enter it, they shall profane it. Make a chain! For the land is full of bloody crimes; the city is full of violence. I will bring the worst of the nations to take possession of their houses. I will put an end to the arrogance of the strong, and their holy places shall be profaned. When anguish comes, they will seek peace, but there shall be none. Disaster comes upon disaster, rumor follows rumor; they shall keep seeking a vision from the prophet; instruction shall perish from the priest, and counsel from the elders. The king shall mourn, the prince shall be wrapped in despair, and the hands of the people of the land shall tremble. According to their way I will deal with them; according to their own judgments I will judge them. And they shall know that I am the LORD. When God made a promise to Abraham, because he had no one greater by whom to swear, he swore by himself, saying, "I will surely bless you and multiply you." And thus Abraham, having patiently endured, obtained the promise. Human beings, of course, swear by someone greater than themselves, and an oath given as confirmation puts an end to all dispute. In the same way, when God desired to show even more clearly to the heirs of the promise the unchangeable character of his purpose, he guaranteed it by an oath, so that through two unchangeable things, in which it is impossible that God would prove false, we who have taken refuge might be strongly encouraged to seize the hope set before us. We have this hope, a sure and steadfast anchor of the soul, a hope that enters the inner shrine behind the curtain, where Jesus, a forerunner on our behalf, has entered, having become a high priest forever according to the order of Melchizedek. After this the Lord appointed seventy others and sent them on ahead of him in pairs to every town and place where he himself intended to go. He said to them, "The harvest is plentiful, but the laborers are few; therefore ask the Lord of the harvest to send out laborers into his harvest. Go on your way. See, I am sending you out like lambs into the midst of wolves. Carry no purse, no bag, no sandals; and greet no one on the road. Whatever house you enter, first say, 'Peace to this house!' And if anyone is there who shares in peace, your peace will rest on that person; but if not, it will return to you. Remain in the same house, eating and drinking whatever they provide, for the laborer deserves to be paid. Do not move about from house to house. Whenever you enter a town and its people welcome you, eat what is set before you; cure the sick who are there, and say to them, 'The kingdom of God has come near to you.' But whenever you enter a town and they do not welcome you, go out into its streets and say, 'Even the dust of your town that clings to our feet, we wipe off in protest against you. Yet know this: the kingdom of God has come near.' I tell you, on that day it will be more tolerable for Sodom than for that town. "Woe to you, Chorazin! Woe to you, Bethsaida! For if the deeds of power done in you had been done in Tyre and Sidon, they would have repented long ago, sitting in sackcloth and ashes. But at the judgment it will be more tolerable for Tyre and Sidon than for you. And you, Capernaum, will you be exalted to heaven? No, you will be brought down to Hades. "Whoever listens to you listens to me, and whoever rejects you rejects me, and whoever rejects me rejects the one who sent me." The seventy returned with joy, saying, "Lord, in your name even the demons submit to us!" 18 As often as I said, "My foot has slipped," your love, O LORD, upheld me.